The late Stephen Jay Gould (1941-2002)—Agassiz professor of zoology, paleontologist, theorist of evolutionary biology, baseball fan, and Astor visiting professor of biology at New York University—is probably most widely known for his popular writings and his torrent of essays, especially his regular column in Natural History magazine, “This View of Life” (a title taken from the concluding words of Charles Darwin’s On the Origin of Species). Harvard University Press published Gould’s magnum opus, The Structure of Evolutionary Theory (all 1, 464 pages of it), in the year of his death. Now, keeping the other side of his work in print, it has issued trade paperback editions of seven volumes (four collections of the essays, three original popular works) originally released commercially between 1995 and 2003. 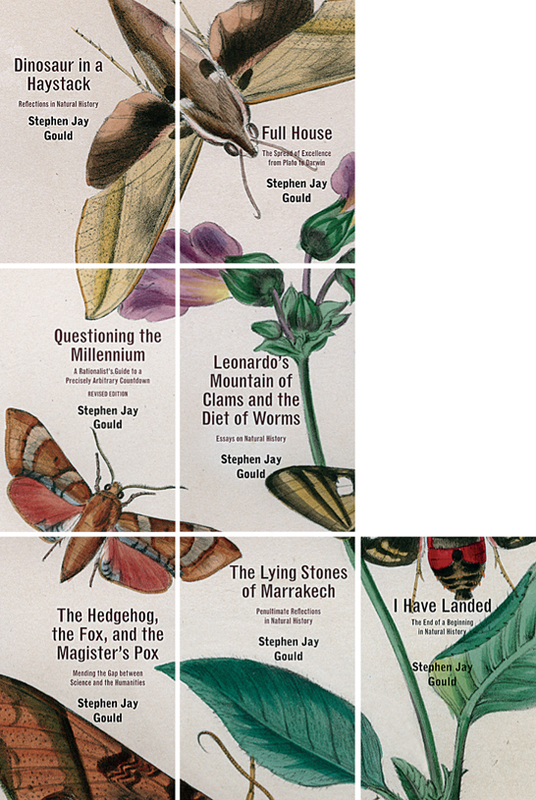 The series is handsomely unified by the quilt-like use of cover illustrations derived from a plate originally used in The Cabinet of Oriental Entomology (1848), by John Obadiah Westwood, another nineteenth-century English naturalist, who came to his passion as a lapsed lawyer—a crossing of boundaries that might well have pleased Gould himself.